Junior Achievement Latvia (JA Latvia) has successfully organised the International Student Company festival. It was attended by 102 companies from 13 countries. The best companies were selected in eight categories. Majority of prizes were awarded to companies from the Nordic countries – Finland, Denmark, Sweden and Estonia. The evaluation and awarding of Student Companies was carried out in 6 nominations - Innovative Business Idea, Socially Responsible Business, Best Sales Team, Best Stand, Best Video Advertisement and the Best 2018 Student Company. Selected awards were awarded by JA Latvia graduates and companies – tenants of the mall Domina Shopping. 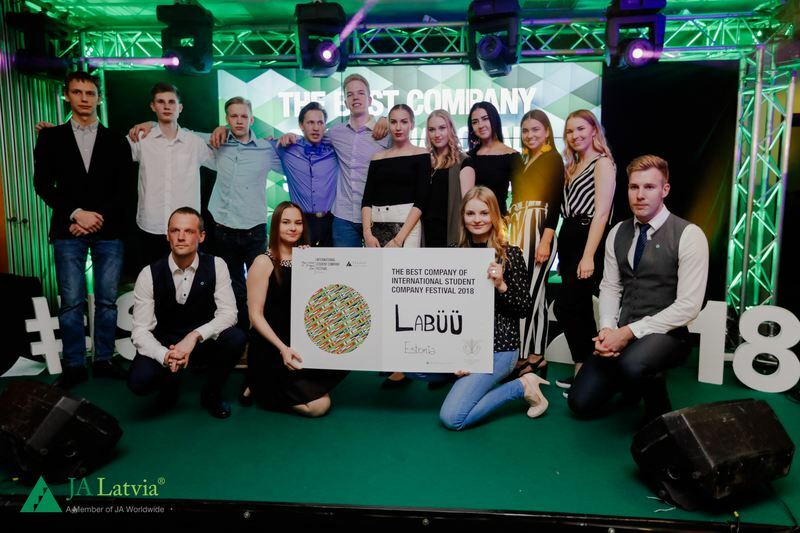 The Best 2018 Student Company was awarded to "Labüü" from Estonia which was the main winner of the event with the largest total score in all categories. The company produces wooden balancing boards that also have a labyrinth game, making the workouts exciting. Danish company “UnoBrush” received the Innovative Business Idea prize. It manufactures hands-free toothbrushes that are making tooth brushing easier, smarter, faster and more hygienic. Israeli company "MILESTONES" was recognized as the most socially responsible business. The company produces an educational game for the whole family that helps players learn the rules of the road and their significance. The Best Sales Team this year was the "Youth Store YE" from Sweden, which sells a wide range of customized T-shirts and sweaters. The company prints and customizes all of its products. Latvian company "HandySac" received the Best Stand prize. It manufactures waterproof sports bags with two pockets and promotes patriotism and sense of belonging through the use of national symbols. In preparation for the festival, each Student Company had to prepare not only its product and a presentation about it, but also a video advert. The Best Video Advertisement prize went to "Cafcoa JA-YE" from Finland, who created and displayed a creative story about their product. The graduates of the Junior Achievement program also selected their favourites in the nomination "JA Latvia Alumni International Potential Award" which was awarded to the company "Edible" from Estonia. It produces edible and biodegradable cutlery to replace plastic tableware. The tenants of the Domina Shopping mall evaluated enterprise presentations to select the ones with the highest investment potential. The best ones in these presentations were companies "So Fann" (Estonia, Finland, Latvia) which manufactures waist-bags, "Bakslang" (the Netherlands) that invented a custom-made shape for cakes and "Edible" from Estonia. The JA Student Company evaluation in the festival was carried out by an experienced team of local and international business professionals and academics, representing the Latvian Investment and Development Agency, the Latvian Chamber of Commerce and Industry, the RTU Riga Business School, inbox.lv, the School of Business Administration Turiba, the University of Latvia and the Business Incubator at the University of Latvia, Pars Advert, Gateway & Partners, TechChill Foundation, MRS Group, Latvian State Forests, business representatives from Domina Shopping, Printful and JA Latvia program graduates. The international festival gathered together 102 students from 13 countries and their educators. The festival was opened with a business education conference for educators and culminated on April 10th with the trading event "Cits Bazārs" where Student Companies displayed and sold their products to the visitors and jury. Furthermore, 21 joint ventures from Estonia, Latvia, Finland and Sweden participated in the " Cits Bazārs ".